A referendum is going to be held in Greece on a new European debt deal made last week. 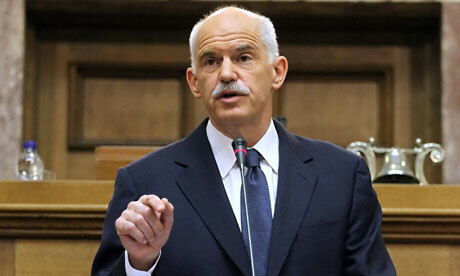 Greek Prime Minister, George Papandreou has made this announcement so that citizen can give their view regarding the new loan arrangement. He has further said that by the rule of democracy, people are independent and responsible for making their own and their country’s decision. There is a complete trust of government on the citizens that they will take the right and correct decision in favour of their nation. Eurozone leaders had agreed last week a second, 130-billion-euro ($180 billion) bailout for the cash-strapped country as well as a 50-percent write-down on its massive debt to make it sustainable. Opinion polls show most Greeks view the deal negatively. It is reported that the referendum will be held in a few weeks, after the agreement is finalized. It will be the first referendum in Greece since 1974 when the monarchy was eliminated by a landslide vote, held months after the collapse of a military dictatorship. The Greek government’s majority has reduced to just three seats in parliament. Its approval ratings and popularity also have fallen severely. Almost 60 percent of Greeks view this new EU summit agreement on the new bailout package as negative or probably negative, according to a survey on Saturday. The country looks set to spend its fourth year in recession in 2012. Lady Gaga Keeps Begging For Attention!